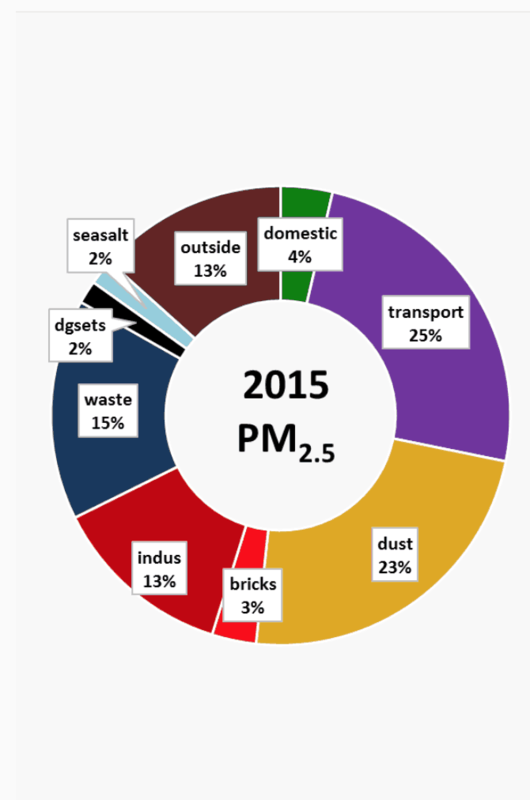 Chennai’s air pollution scene has progressed from moderate to poor, but despite the alarming data from the Tamil Nadu Pollution Control Board (TNPCB) and private agencies, the focus on dust pollution, that has a strong connection with poor air quality, takes a back seat in the city. According to a study conducted by Urban Emissions, dust contributes to 23% of the PM2.5 levels (particles with diameters of 2.5 micrometres or less) in Chennai. The study was conducted to represent the mix of pollutants in Chennai’s air, using satellite feeds and global chemical transport models. 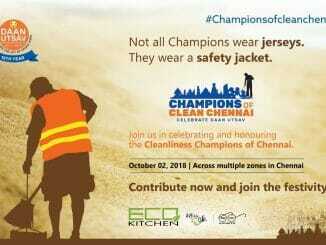 A question that naturally arises therefore is this: What is kicking up the dust in Chennai? To answer in brief, unsustainable industrialisation and unabated construction activities. Non implementation of rules in industries and construction sites is primarily responsible for the lethal dust pollution in the city. To curb dust pollution, the Union Minister of Environment, Forests and Climate Change (MoEFCC) , Prakash Javadekar, notified the Construction and Demolition Waste Management Rules, 2016, for the first time and asked the Urban Development Departments from every state to prepare a policy within a year. Urban development is shared between two sub-departments — Housing and Urban Development and Municipal Administration and Water Supply. A top official from the department admitted that even after two years since the issue of the notification, the Municipal Administration and Water Supply department, the nodal department for preparing a policy on construction/demolition waste rules in Tamil Nadu, has failed to comply with the union ministry’s instructions. He was unable to comment on the reasons for the same and calls to the Secretary of the Department went unanswered. However, the official did say that the central government’s rules on construction and development management are also part of the Environment Protection Act and every citizen must adhere to it. * Mandate: The concerned department in the State Government dealing with land shall provide suitable sites for setting up of storage, processing and recycling facilities for construction and demolition waste. Reality: The Municipal Administration and Water Supply Department and the Chennai Corporation that shares the responsibility in Chennai have not even placed adequate dustbins for waste disposal, and expecting them to facilitate processing of construction waste is a dream, says Arun Ravula, a citizen. *Mandate: Green dust barrier sheets should be mounted at all construction sites to prevent dust borne material (such as bricks, cement, stone aggregates of various sizes, soil, gravel and cement) from reaching the roads. 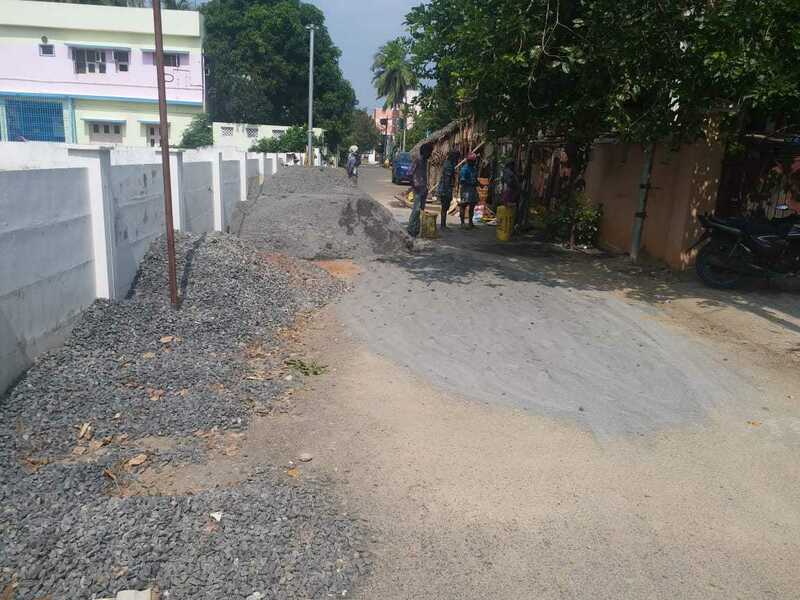 Reality: Any Chennaite is familiar with sights of construction material including gravel at the metro rail sites being dumped on the roads uncovered, leading to dust pollution. Similarly, the never ending government projects such as Pallavaram flyover and Velachery flyover kick up a lot of dust during the making, as the norms are rarely followed,” said Arjun Nagu, a sales executive, who commutes regularly on the city roads. “Dust reaches the second floor of houses close to the Velachery flyover construction, if not higher. 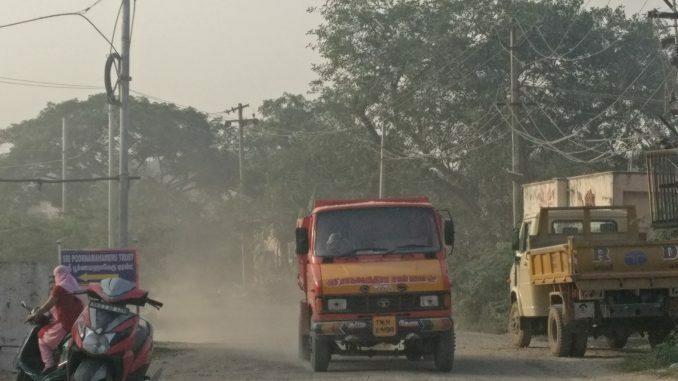 Being a school zone, a lot of children who take the road are inhaling poisonous dust particles from the construction site,” said one resident, Geetha Ganesh. *Mandate: Waste generators must segregate the waste into recyclables (such as metal) and disposables (such as dust and left out gravel) and ensure that they are disposed of at the recycling facilities on a daily basis. Reality: There is no recycling facility in Chennai for construction waste. “The idea behind the C & D rules is to reduce the burden on natural resources, through recycling. For example, crushed rock from construction sites can be converted to manufactured sand. There has to be a system where the workers from the corporation set up recycling facilities and collect the waste regularly. Only then would the market for construction waste be set up. Currently, one can see that the broken brick waste is routinely dumped off on the Pallikaranai marsh land, illegally of course” said Dharmesh Shah, activist with Beat the Plastic initiative. *Mandate: Waste generators should submit a proposal to the planning authority — which would mean either the local bodies (Chennai Corporation or Municipalities or Town Panchayat, depending on the location) or the Chennai Metropolitan Development Authority depending on the size of the building — about the management of construction and demolition waste. Reality: “We don’t submit any such proposals. In case of demolition of a building, a fee has to be paid to the local body, though we don’t know the reason for it. We take measures to hire a contractor to manage and dispose of the construction waste,” said a member of CREDAI, seeking anonymity. *Mandate: Every construction material should be recycled and reused. Reality: “Scrap material, metals and slightly broken bricks from construction sites generate a lot of demand. Broken bricks can be used to cover potholes and as coolants on the roofs; metals and other scrap are sold off in shanties in Pallavaram, Chengalpet and OMR. However, most of the items such as completely damaged bricks, plastic and stones are often simply disposed of in the dust bins,” said R Vimal, who has been in the construction sector for twenty years. The complete guidelines issued by CPCB on dust mitigation measures in handling C & D waste can be read here. North Chennai, a hub for petro-chemical and thermal power plants has very high levels of air and dust pollution. Though industrial presence is mostly confined to Ennore and surrounding villages, the impact is felt in other parts of the city as well, as proven by a study by The Coastal Resource Centre in May 2017. Air samples collected in Poes Garden and Boat Club, that are around 30 km away from the thermal power plants in Ennore, has components of coal ash such as calcium and iron. 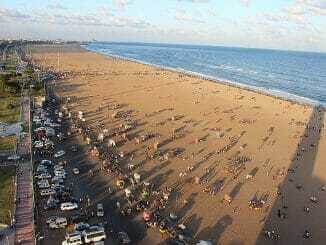 “The pollutants present in the geography of Ennore and Poes Garden are the same. Fly ash disposed by the thermal power plants has raked up pollution in Chennai,” said Shweta Narayan of the Health Energy Initiative. 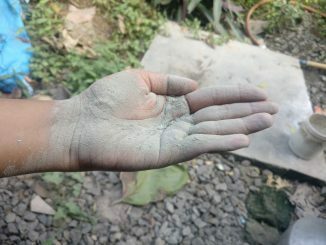 For the fisherfolk community in Ennore, toxic fly ash has become a part of their lives and they cannot avoid it anywhere — neither in the waters where they venture for their livelihood, nor at home. “We don’t even have the option of opening our windows, for fear of dust pollution. More than 80 per cent of the residents suffer respiratory problems, due to inhaling the air,” said Suresh Kumar, who owns a tea kiosk at Ennore. 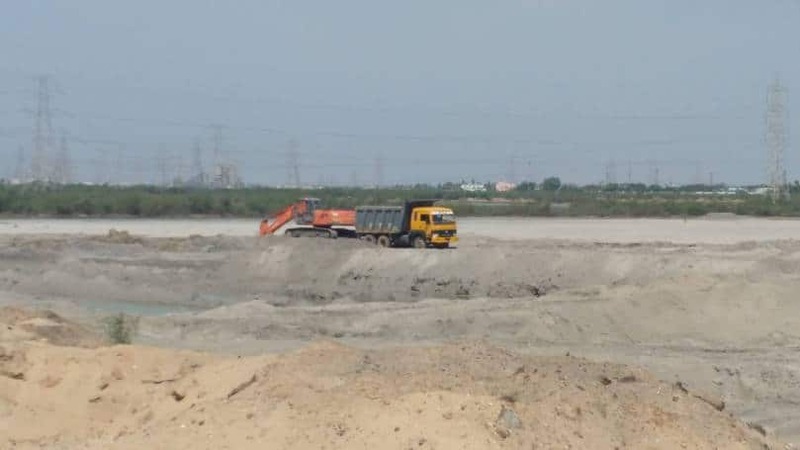 Despite several warnings by the southern bench of the National Green Tribunal and protests by Ennore fishermen, the thermal power plants have not found a way to reuse fly ash, thus contaminating the coastal city’s air.